Redcon1 needs no introduction, the company that stormed the supplements world with their Total War Pre Workout is bringing you their latest RTD form of Total War, which is supposed to compliment the powder form. Redcon1 has some of the best supplements in the market and I reviewed a few you should definitely check out like REDCON1 BOOM STICK Review, Redcon1 RPG Review and RedCon1 MRE Review. The idea behind the Total War RTD is having these around at gym fridges, and lord knows we need a positive, refreshing change in these fridges (ABB speed shot doesn’t cut it anymore! ), and it’s just great to have an on-the-go for RTD Pre Workout rather than the powder. The label is a bit different than the Total War powder form, so let’s go through it. 6g Citrulline-Malate and 1g Agmatine make a perfect pumps formula that is the same as the powder form. This is already far better than anything you would find in your standard gym fridge. Beta-Alanine at 3.2g is just the right amount for tingling and endurance, along with Taurine at 1g – there’s enough to help with endurance and muscle pumps. Caffeine Anhydrous at 300mg, DiCaffeine Malate at 100mg and Theobroma at 25mg make for a great stim package. This differs from the Total War powder form in a couple of ways. For starters, the powder form has AMPiBerry at about 150mg which this doesn’t have, and Narangine which helps with fat burning, so that’s missing as well. Lastly, this doesn’t have Bioperine which helps with absorbability. My guess is they removed these ingredients for taste purposes, as there is not as much flavor flexibility with an RTD and it’s really hard to make it taste good with all these ingredients. They did, however, add 50mg more Caffeine, so this does have more stims in weight compared to the powder form. All in all, very similar package – solid pumps package, good endurance package with the Beta-Alanine and Taurine, and a basic but well thought-of package of Caffeine. You could say there are 3 types of caffeine with Caffeine Anhydrous, DiCaffeine Malate that has a prolonged effects, and Teobroma which helps with prolonging the effects and getting less desensitized to the stims. If you liked the powder form of Total War you’re going to like this one. There’s not that much difference and it feels pretty much the same. The taste part is actually important in RTD, and I tried the grape flavor. This one is definitely on the sweet side, if you like sweet grape flavor you’re going to like this. I am not that into sweet so I almost felt like adding water to it. 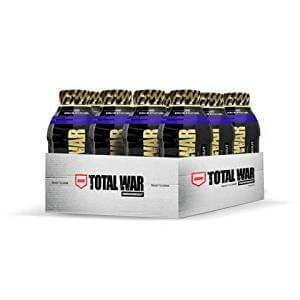 As far as effectiveness – it is super similar to the REDCON1 Total War Pre-Workout Review I did, so if you liked Total War as a pre workout you’re going to like this just as much. If you’re a stim junkie and looking for DMHA, DMAA and the rest of them, then this is not for you just as much as the powder Total War is not for you. 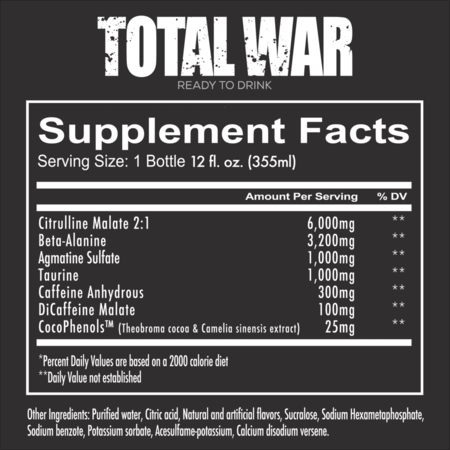 This is Total War in an RTD form, and they compensated for the AMPiBerry, Narangine and Bioperine with the extra Caffeine. All in all, if you gave me the powder vs. the RTD Pre Workout I wouldn’t be able to tell the difference – besides the fact I am enjoying this as a chilled drink. The bottle is nice and compact as well which I liked. As this is Redcon1 I am assuming you could find this basically everywhere. You can find it in the Redcon1 website, and you should surely check out the Redcon1 Total War RTD to compare price before buying this. This RTD Total War pre workout definitely delivers on the promise. It is as good as the powder form (which is one of the top pre workouts out there) and I totally dig the RTD form of it. I hope to see this at every gym around, cause we NEED it!